But things rapidly got worse for Dink in January 2007. Sentenced by a court for "insulting Turkishness," he was vilified by mainstream newspapers and called into a meeting at the Istanbul governor's office to be warned that he had gone too far. "I am now a target," he wrote. "My soul," he wrote shortly after the meeting, "has the skittishness of a dove ... a bit frightened, but free." The day those words were published, Dink was gunned down outside his newspaper's office, shot in the head three times by Ogun Samast, then 17, who was later apprehended in Trabzon, a city on the Black Sea coast, where patriotism and machismo run high. Leaked pictures showed police and army officers apparently giving the young man a hero's welcome: they posed, smiling, against the backdrop of a Turkish flag. Samast's trial in juvenile court ended last July with a 23-year prison sentence. But Dink's family and supporters have pushed for a full investigation into the affair, leading to a separate trial for other alleged conspirators that began in 2007 at the same time of the Samast procedures. The police, Dink's advocates argued, knew of the plot to kill him and did nothing to prevent it. He was deliberately targeted, they say, as part of a well-orchestrated plan to provoke violence. In 2010, the European Court of Human Rights concurred. The question of a larger conspiracy became a test of Prime Minister Recep Tayyip Erdogan's government's self-professed desire to finally purge nationalist elements within the police and bureaucracy who believe themselves beyond the reach of the law. On Tuesday, an Istanbul court ruled that Yasin Hayal, a militant nationalist, was guilty of masterminding the murder and sentenced him to life. Two other men, Hayal's friends, were sentenced to 12 years each for helping him. But it rejected claims of a wider plot and dropped conspiracy charges against 19 suspects, including the accused instigator Erhan Tuncel, a member of a far-right nationalist party and allegedly a police informant. "This ruling means a tradition was left untouched. The state tradition of political murders," said the Dink family's lawyer Fethiye Cetin outside the courtroom. "The tradition of the state discriminating against some of its citizens and turning them into enemies." Hundreds of supporters carrying Dink's picture and chanting slogans accompanied her. "The murderers will be made accountable," they chanted. "This case won't end here." "The Turkish authorities have failed to address state officials' alleged involvement in the killing of journalist and human-rights activist Hrant Dink," said Amnesty International. "The security services knew of the murder plot and were in communication with those accused of the murder, yet nothing was done to stop it taking place." According to rights activists, the case file is riddled with contradictions, misplaced evidence, ATM-camera footage that mysteriously disappeared and dozens of other suspect details. Even more striking is that since the trial began in 2007, several individuals believed to be involved in Dink's assassination have been arrested in connection with Ergenekon, an alleged ultra-nationalist network that sought to topple the government. Yet lawyers have been unable to question them about their connection to the Dink case. 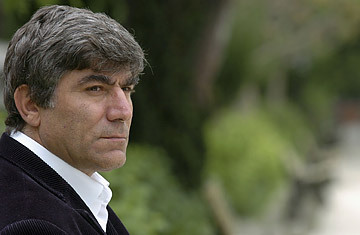 "This shows us that the boundaries between who is immune from prosecution or not are predrawn, and you can only go after someone when the state deems it appropriate, which is not the case for Hrant Dink's murder," said the Istanbul-based Human Rights Platform in a special report. Turkey's President Abdullah Gul promised last year to personally pursue the case  "a clean Turkey," he said, "was a personal responsibility." He ordered state auditors to look into the allegations, although little has come of that initiative, and his reaction to Tuesday's verdict remains to be seen. Dink's family  his wife, son and daughter  will likely appeal the ruling. Read "Editor's Death Spotlights Turkish Nationalism."